After a week lakeside in Maine, I went into town to do laundry. That’s when I met Dinah. The laundromat is just one of her lines of business. Some are unsurprising (altering and repairing clothes, and renting out the apartments upstairs). But one of her business lines came to my attention in an unexpected way. Two minutes later I looked out the window and did a double-take. Dinah chugged by on a gleaming red Case tractor, bucket up, with a big load of pellets for the customer’s wood furnace. Especially in a small town, multiple revenue streams can make for a more successful business. 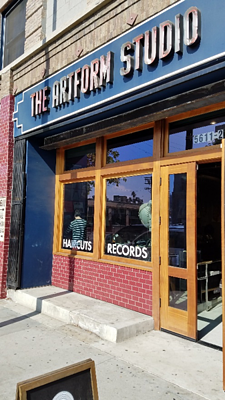 It interested me to find that in L.A.’s Highland Park neighborhood, women and men can get their hair styled and buy carefully curated vinyl records in the same shop. Heartland farmer Sarah Frey began with melons and expanded into pumpkins, landing supply contracts with Walmart, Trader Joe, and other big chains. Frey Farms is now the largest pumpkin producer in the USA. 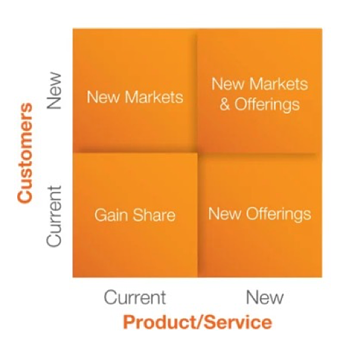 Do you have room to increase sales of your current product/service offering to the same types of customers? Sometimes a company that has a solid offering only needs better penetration of existing customers, and more prospects of the current type that it can convert into customers. For example, think in terms of your opportunity pipeline or funnel. How can you increase conversion at each stage? For thoughts on how to do this, see my April post, The Conversion. Also, unless your customers are in an oligopoly industry where the few customers are well-known, take a fresh look at additional companies you could be calling on. Find the North American Industry Classification System (NAICS) code for each customer type, and then use a free research source such as ReferenceUSA or paid source such as D&B or NetProspex to identify other potential customers. 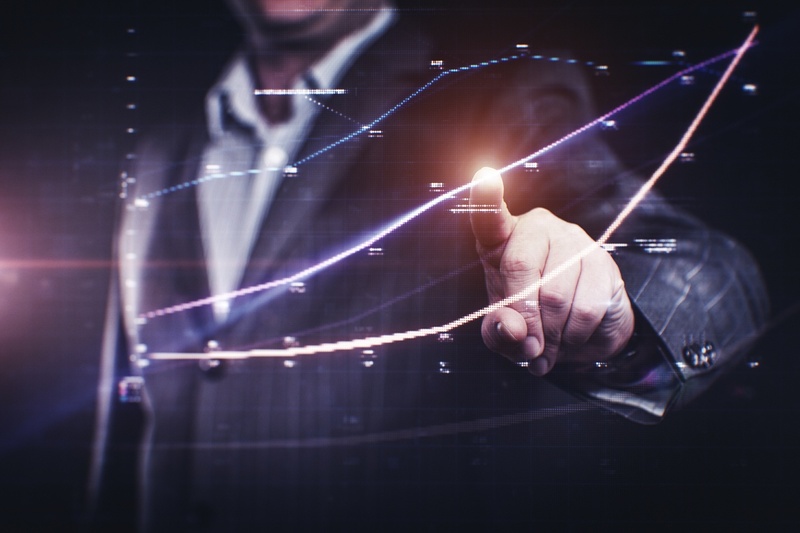 If, on the other hand, your market penetration is high, and you can expect an effective competitive defense again your sales efforts, selling new products/services to the same types of customers can be a great way to grow. As an alternative to developing your own new products, might you license or source a product that would complement your current offering? Can you assess how much value these services create, package them up, and market them? This can create a new—or new enough—offering to make a difference. The key is developing a positioning and clear, strong value messaging that connects your capabilities to the outcomes your customers and prospects want. Whether you charge for this package, or just get prospects and customers to see the value and say yes, you can grow sales. I see Hidden Value much too often—companies that deliver great value to customers, but don’t fully understand their own value. Hidden Value serves no one well. It leaves prospective customers making under-informed “no” decisions, or hesitating to say “yes.” The companies get fewer yeses, the sales cycle takes too long, and they experience pricing pressure because prospects aren’t seeing the true value. Solving that problem is why I developed VisibleValue® differentiation development. Can your business benefit from adding a revenue stream, whether from new products, or a packaged offering that makes its value visible? Let’s schedule a call to talk about your goals and how Chief Outsiders and I may be able to help. Head over here to schedule a call with me. 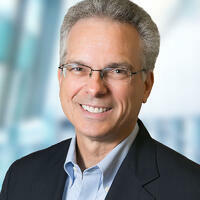 A sought-after strategic, creative marketer with several decades in B2B and consumer durables marketing, Bob Sherlock joins Chief Outsiders with a focus on helping executives uncover market-driven solutions to sales inertia. Sherlock is focused on helping companies ward off customer pricing pressure by identifying hidden value and attracting the right customers. His experience includes consulting at Marketwerks and The ProAction Group, and founding and running a venture-funded logistics service provider operating a network of automated, unmanned delivery drop points. Prior, Sherlock was CMO for Wickes Inc., a distributor and retailer of building materials.